Jane and Paul scale icy slopes and huddle together for warmth at night, forging an intense emotional bond. But the wilderness is a vast and lethal force, and only one of them will survive." Jane Solis wants to die. She has a plan - when she boards the plan, she will take a combination of pills and cough medicine and by the time the plan lands, she will be in oblivion. Dead. She can't help it. This seed was planted long long ago and now it's finally time to sprout. But the plan goes horribly wrong when her plan crashes in the mountains. Everyone has died, except her and a boy named Paul. Now Jane is re-evaluating her life and her will to survive is getting stronger. But can she do it or will she finally find the oblivion she so desperately wanted? This was a fantastic story! It was a short, fast read - packed to the brim with action. For a plot line that could have gone horribly wrong, it was so right. Majority of the book is them climbing mountains or hiking, and that for me was a bit of a downer, but the detail and the emotion that has been written makes this story exhilarating rather than what could have been quite boring. The strength that these two characters had was unbelievable! They could have sat, waiting for help and died. But they didn't. They were both smart, figuring out that they had to move, had to try and get found or they wouldn't survive. 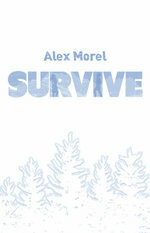 Survive - the word that constantly flickered through my head while reading. Would they survive? Would it be both of them? Will they have the emotional strength to carry on? These questions begged to be answered, pushing me to keep reading. At first, Jane annoyed me. For a girl who was so ready to die, to suddenly change her tune bugged me. But the more I read on, the more I realised it was just her survival instincts kicking in. In the face of death, and the death of someone else, she began to realise it wasn't all about her. Paul was such a gorgeous character, I was cheering for him the whole time. For Jane to be stuck with him over all the other passengers, she was pretty lucky. The fact that romance bloomed despite their situation really warmed my heart. I highly recommend this book to all who love a simple and fast read! Great review! I've been itching for this one. Check out www.sahodges.blogspot.com for free YA book giveaways.